We ran into a problem recently where we had some long-running computations that needed to take place, but we did not want it slowing down the user’s experience. Our approach was to spawn a new thread for the computation and simply alert the user when it has completed. This, we found to be unexpectedly difficult to do with Unity and Microsoft HoloLens, but we have managed to find a solution. 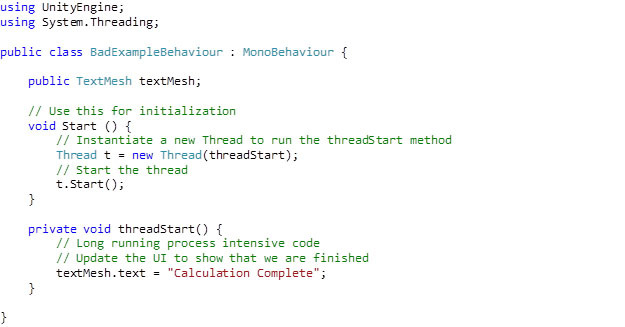 Before getting to our solution, I wanted to discuss a little bit about using threads in Unity in general. Can’t we simply put any operation we want to do asynchronously into a coroutine? 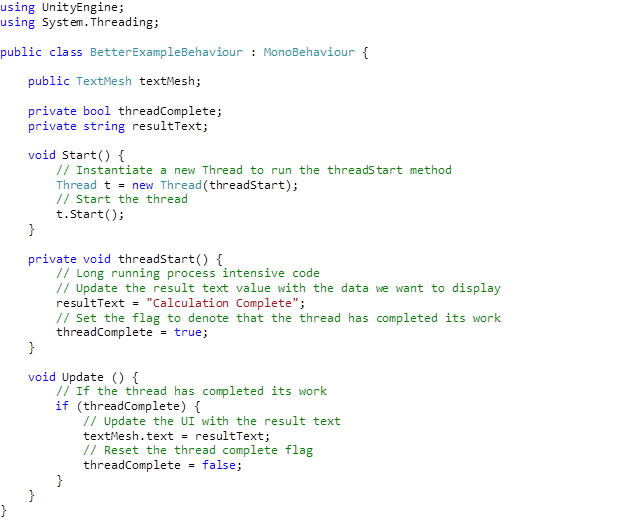 A coroutine in Unity is not the same as using a different thread. All operations done within a coroutine are still performed on the main thread, which in turn could affect your performance. Depending on the type of yield used, your coroutine will simply continue to execute after all the update functions have been called, an amount of time has passed, or specific conditions are met. This execution will still occur on the main thread—certainly not the same as creating and executing a new thread. Once you’ve decided to use a new thread, what are some of the limitations that you may run into? 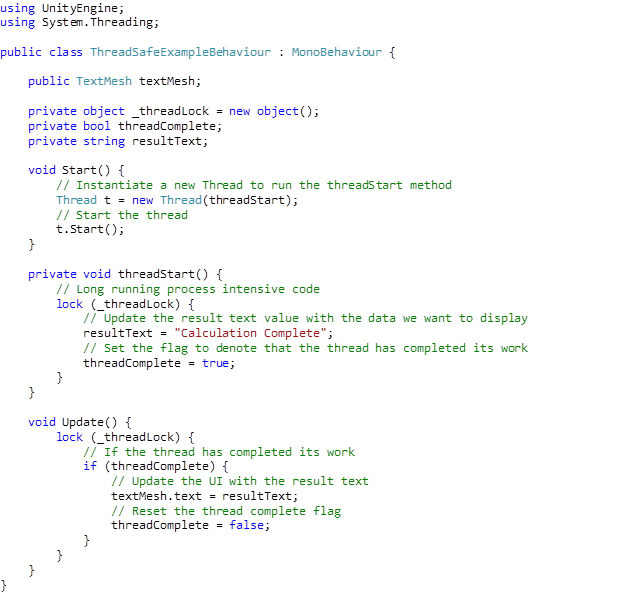 The Unity API is not thread safe. This means that you cannot access or modify any objects in your scene, or even API level utilities like Debug.Log. All of the Unity API work must be done on the main thread, and Unity has included checks in the framework to make sure that this is the case. Unfortunately, this also includes creating an instance of a prefab or interacting with the asset database. 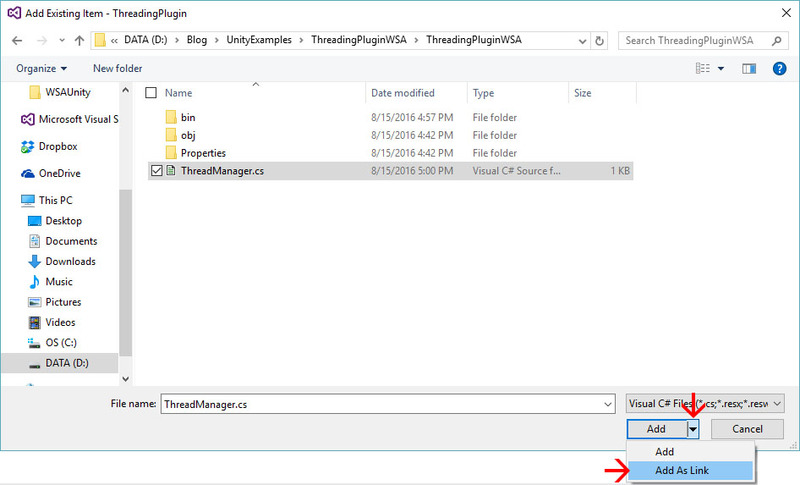 In order to work with this, both the main thread and the new thread can access the same memory space to modify data within the thread, or for the thread to notify the main thread when it has completed its work. You should just remember to make this data thread-safe to avoid race conditions and collisions. The following is an example of what cannot be done in Unity. 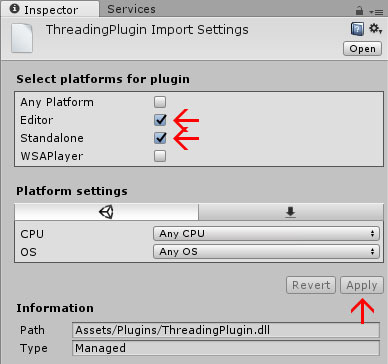 The next example will work in Unity, but is not considered thread safe. Finally, we can use a simple lock to guarantee that only one thread is accessing the shared properties at a time. This is due to the fact that Unity is using .NET/Mono framework version 3.5, while a Windows Store App is using .NET version 4.6. The implementation of System.Threading has changed between the two versions in a way that is not backward compatible. Our solution for including .NET version 4.6 features that the HoloLens will use through Unity is by building a custom plugin. The project just created will be the one used by the HoloLens as the HoloLens supports Universal Windows Platform applications and .NET up to framework version 6.5. Unity, on the other hand, supports only .NET/Mono up to version 3.5. For this reason, we will create a new project to use as a stub by unity and then be replaced with the UWP assembly when built as a Windows Store Application. 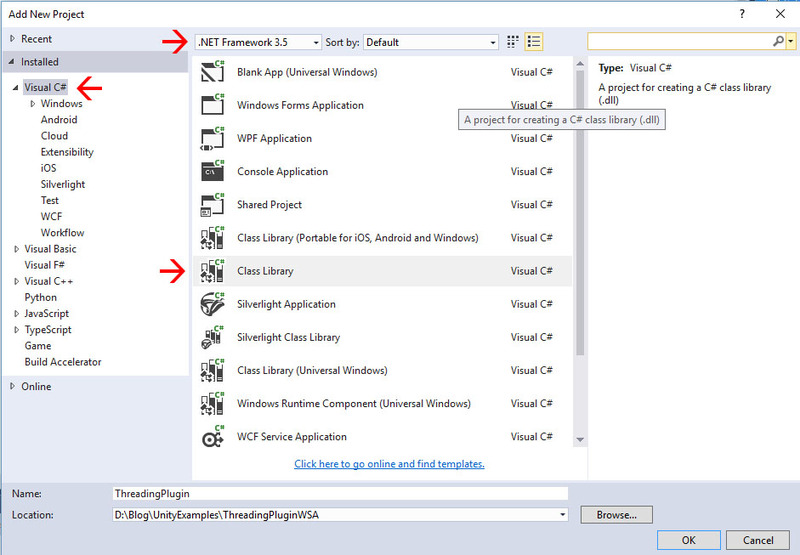 In the Solution Explorer; Right click on Solution and select Add -> New Project… from the context menu. This will be your stub project and will only be used by the Unity Editor. Since we don’t want to replicate all the same changes in both projects, we have created a soft link to the same file in both projects. Therefore, any changes made in one project will be in both. This is due to the fact that the System.Threading namespace is not available in .NET 3.5, but it is available in .NET 4.6; so it is time to use some compiler directives. 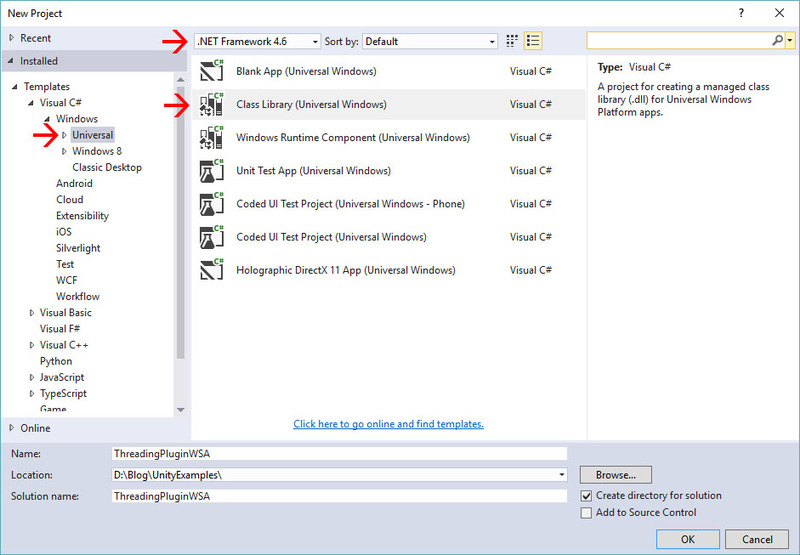 By default, the UWP Project will have NETFX_CORE and WINDOWS_UWP defined as compilation symbols. Unity also provides a number of symbols defined that can be used to segregate your code. A complete list can be found here. We can now see that if the file is opened from the Stub Project, the using declaration is greyed out meaning that it will not be compiled. But, if we open the same file from the UWP Project the declaration appears normal. 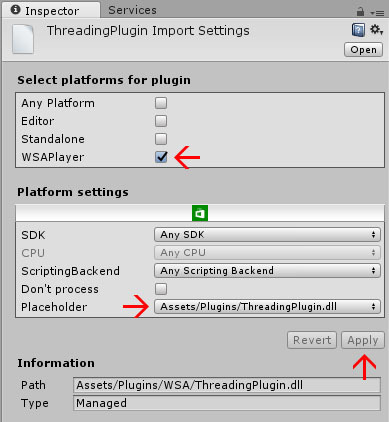 Now, when you return to your Unity scripts, you should have access to any code included in your plugin assembly. Any updates made to your plugin will have to be made and recompiled from Visual Studio, before they will be available from your Unity scripts. Now that we have created a plugin that can be used in both Unity and HoloLens, we can implement some threading functionality within the plugin. The following is a very simple start of a thread manager plugin. Since the NETFX_CORE symbol is only loaded for the UWP project, it will not be utilized by the Unity Editor. Code running within Unity will utilize System.Threading.Thread while the HoloLens will use System.Threading.Tasks.Task. To use this plugin from our Unity scripts, you can see the changes required for our previous example below. Using threads within a HoloLens app is definitely possible. There are a few extra steps involved, and as always when writing a multi-threaded application takes some careful consideration. But, as long as you remember not to use the Unity API from within your new thread and alert the main thread of changes in a thread safe way, it can be very useful. 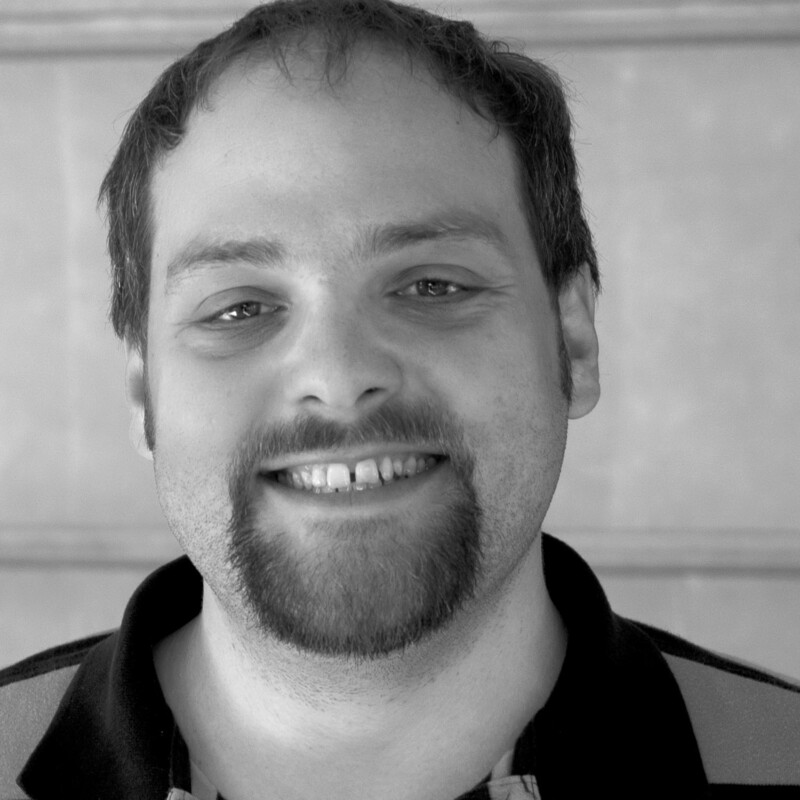 Rob is a developer in the IC specializing in user interface and networking solutions. Rob has a long history in programming web enabled applications.